Some bike locks come with reimbursement guarantees if your bike is stolen, but note that you might have to sign up on the company’s website in order to be eligible for one of these guarantees. You spent a lot of money on your bike, so the last thing you want is for it to get stolen while you're off enjoying the day. A good bike lock can help prevent this, but the trouble is that it's difficult to know whether a bike lock is up to the task until it's tested. You can get some idea of how well a bike lock will perform by reading customer reviews and comparing features. Here's a brief overview of what you need to know when choosing a bike lock. There are several types of bike lock to choose from, including cable, U-lock, and chain. Cable locks: These are lengths of durable yet flexible cable that you feed through the wheels and around the frame of your bike and secure with a traditional padlock. These bike locks are cheap and they can be a good backup, but they typically aren't secure enough to rely on as your primary bike lock. U-locks: A U-lock is probably your best bet. These are made of hardened metal and shaped to make it difficult for thieves to maneuver their lock-picking tools. U-locks come in different sizes to accommodate bikes of different sizes. You want one that is just large enough for your bike but no larger. Chain locks: These are also pretty durable, but they're heavier than U-locks and not as resistant to theft. Once you've decided on a type of bike lock, you have to consider additional features, such as the following. Locking mechanism: Most bike locks require a key to open. These are more secure than combination locks, which can be easily shimmed. Electronic locks can be unlocked automatically at your approach or by entering a code on your phone, but these are expensive. Some are battery powered, so they're not as reliable as key or combination locks. 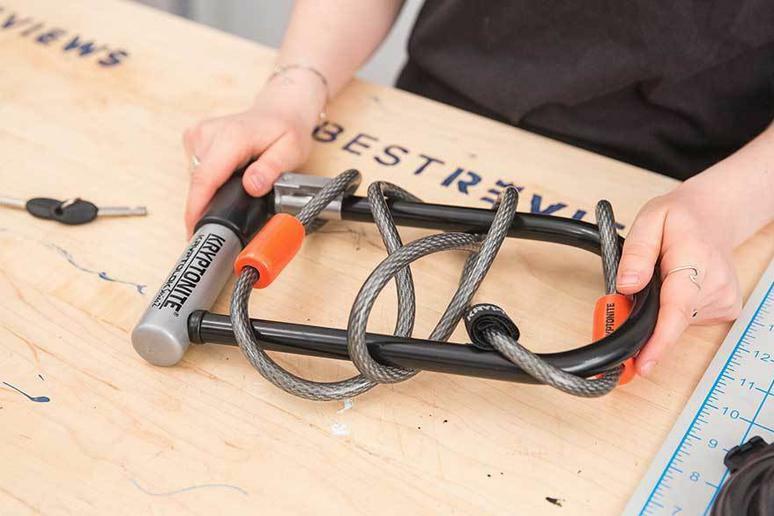 Durability: The best bike locks are made of heavy-duty materials that resist cutting. Their locks have undergone extensive testing to make sure that they're very difficult to break. Casing: Some bike locks are wrapped in a soft housing to prevent them from scratching your bike. Ease of installation: It's important to make sure that your bike lock is installed correctly or it could come loose from the frame. Make sure the lock you choose comes with detailed instructions that are easy to follow. Price: If you live in a low-crime area, you may be able to get by with a bike lock that costs $50 or less. But if you're looking for something that's really tough, you can expect to spend $50 to $100. Q. If I can only secure one of my bike's wheels, which one should I secure? A. Ideally, a bike lock comes with enough cable to secure both wheels, but if this isn't the case, you should always secure the back wheel first. Back wheels are twice as expensive to replace as front wheels. Q. What's the most secure type of bike lock? A. The most secure type of bike lock is one that's made of a heavy-duty metal that can resist cutting. It should also have a keyed entry that resists leverage attacks. Our take: You can't do better than this bike lock if you live in a high-crime neighborhood. What we like: This heavy-duty chain is secured by a hardened double deadbolt that's reinforced with an anti-pull, anti-drill protection system. If your bike is stolen while using this lock, Kryptonite will replace it, up to $3,000. What we dislike: This is expensive for a bike lock, and its weight makes it a little cumbersome to carry around with you. Our take: A more affordable alternative to our top pick if you want a secure bike lock but don't live in a high-crime area. What we like: This hardened steel U-lock has a disc cylinder that resists leverage attacks and anti-rattle bumpers to keep it from making noise while you travel. It also comes with a four-foot double-loop cable that you can use to secure your bike's front wheels. What we dislike: Some questions about the sturdiness of the mounting bracket. Our take: This is a heavy-duty U-lock that can easily withstand most attacks, but it's also a little bulky and heavy to carry around. What we like: This sturdy lock is easy to mount to all bike frames, and it's tough enough to withstand leverage and cutting attacks. In addition to the lock, you also get a cable that you can use to secure the front tire. What we dislike: A few reports of trouble locking or unlocking the bike after a while. Kailey Fralick is a writer for BestReviews. BestReviews is a product review company with a singular mission: to help simplify your purchasing decisions and save you time and money. BestReviews never accepts free products from manufacturers and purchases every product it reviews with its own funds.